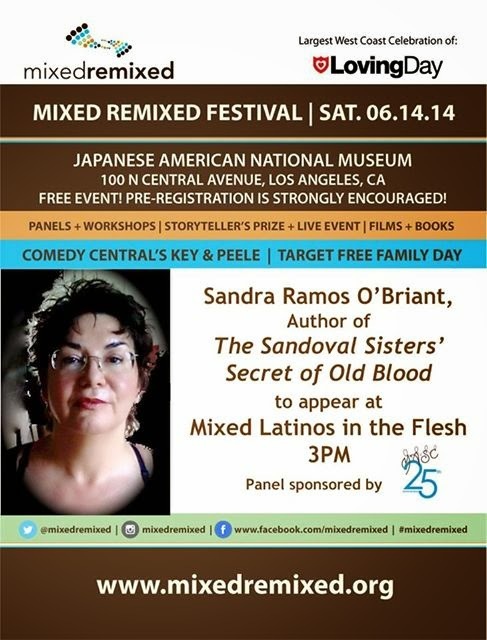 Join Jessica Arana, artist, Joseph Tyner, poet, Elizabeth Liang, writer, and me for Mixed/Remixed at the Japanese American National Museum in Los Angeles this Saturday, June 14 at 1:00pm. There's a full schedule of film, art and books. Ignore the time listed below. It's 1:00 pm!!! We asked our participants to answer these questions: What do you think of the word LOMA (Latinas and Latinos of Mixed Ancestry)? Does this describe you? She said: "LOMA is perfect and it describes me perfectly. Far better than 50/50, coyote, or leprechauna. Also, I appreciate not being lumped into the masculine all-inclusive Latino. 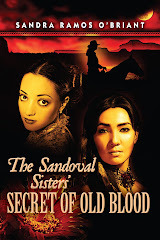 My Latina and Anglo heritage speak loudly in The Sandoval Sisters' Secret of Old Blood, but the Northern New Mexican is emphasized. Thomas, that's a tough one for me. My mom married an Anglo so her children wouldn't experience the same discrimination she'd had to endure. Hence, the O'Briant. My bro and I experienced reverse discrimination in Santa Fe because of that Anglo last name; Latinos wouldn't accept us. The Sandoval Sisters was my shout out to the brown in me. Thanks for including me in this program. See . . . it's all about belonging."